Decided to do more Kool-Aid favors last night. Here is what I came up with for the lemonade. The lemon is from Preserves cartridge. I will be selling these for (hopefully) $2 each. Thats my starting point anyways..
That price seems very fair to me. 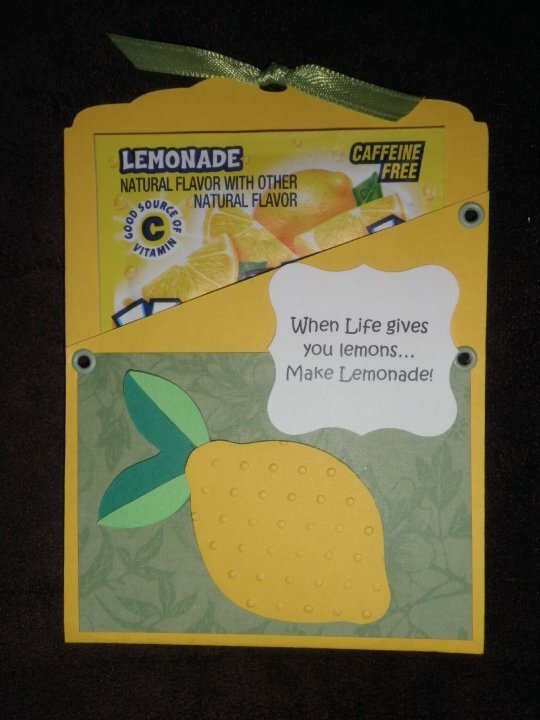 I'm loving this one with the whole lemonade theme!! Great embossing too! This is perfect for a pick-me-up for somebody who's having a rough time. I think it will be quick to sell. Let me know! These kool-aid favours are way too cute. great idea! very cute idea! love the lemon! What a Kool idea! Very fresh and innovative!